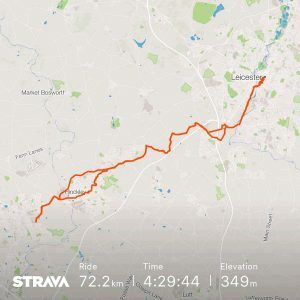 Today marked a milestone in my cycling adventures – I rode to Leicester for the first time, which also marked the first time exceeding 40 miles and the first time exceeding 70 kilometres! An exciting day, indeed. Leicester has been on my radar for a long time, in fact, since before I got my bike. When I was first exploring cycle options in late 2016, early 2017, I was interested in electric bikes and came across the E-Bike Centre. I was wondering about the possibility of cycling back with a new bike at the time, but decided it was probably a bad idea for my maiden ride, even with electric assist. So, why did the ride to (and back from) Leicester occur today? Well, two weeks ago I hit my then personal best for distance at 37.5 miles. I knew Leicester would be a bit over the 40 mile mark and so, it seemed like a good next step. Also, the city holds an Open Streets event on the last Sunday of every month which I’d seen advertised on Twitter. I thought it would be good to see what was going on (more later). So, with a nice sunny day, I set out on my expedition. For the most part, the journey there was uneventful. I knew I could make the outbound distance – 20-30 mile rides are not uncommon for me now – so, it was mainly just keeping track of the route. I’d originally plotted a route from Nuneaton to Hinckley that would have taken me through a very rough track where last time I rode it I’d suffered a puncture. I didn’t want that on this long ride so, straight away I deviated from my plan, and took perhaps a slightly longer route along the A47/A5 to Hinckley, before riding through the town. Whilst that was fine, it did mean the first section really was following my nose and hoping my sense of direction was working. It was, and I re-joined my planned route half-way through the town. From then on, I followed the plotted track on my cycle computer, right into the city. The only other hindrance was a pig of a hill that defeated me – the B562 coming in to Enderby. Ride with GPS puts it at about 7.1% on average, peaking at about 9%! No chance unfortunately. But it wasn’t a long hill so, a short walk and a little rest at the top for a drink and it was fine. 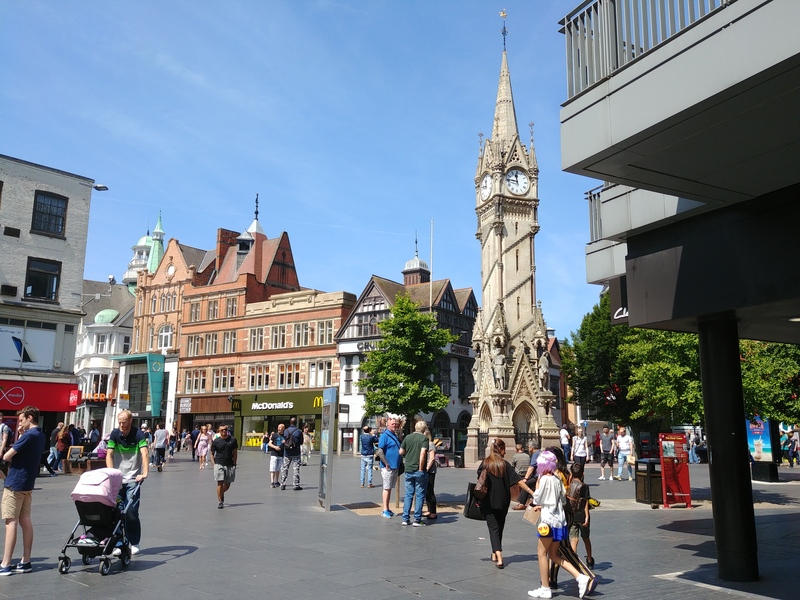 I spent a little bit of time in Leicester as my time of arrival meant lunch would be in order (an egg sandwich, crisps, chocolate cookie and coffee and a water top-up from Pret, if you wondered), but I didn’t want to loiter too long bearing in mind the increasing heat of the day and a long ride awaited me to get home. So, I soon found myself relocating the Great Central Way and heading back. Starting off, I was confident in getting a bit of distance before any aches and pains would start, however I noticed a pain in my bad leg starting only a couple of miles in and easily before the 30 mile mark. This surprised me as two weeks ago on my previous record ride, I managed about 35 miles before I started noticing twinges. Unfortunately, this is the story of the entire route back – an increasing pain in my right thigh which was later accompanied by a nasty ache in my right foot. The ride then was a lot less pleasant, slower and with frequent stops. If that wasn’t bad enough, I think the heat was starting to affect me. I was guzzling through my water supplies and at one time started feeling quite sick as well as struggling to maintain effort. I decided I was probably overheating and resorted to removing my cap, soaked through by this point, which helped somewhat. Extra fuel from a banana was also in order in case this was the dreaded bonk! Both helped to a point, but it was still tough with the leg and foot pain. Still, I just about managed the distance, bypassing Hinckley this time and going around on the A47, which I knew had some nice downhills in that direction. I finally made it home after 44 miles/72 kilometres, rather tired, suffering, but at least not collapsed in a heap. 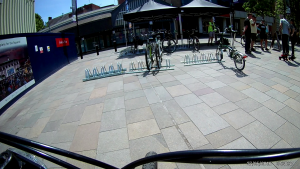 Leicester is an interesting city for cycling. Compared to riding around in North Warwickshire and Coventry, facilities are significantly better, even out of the city (the A47 around Hinckley has a half-decent attempt at a segregated cycleway, albeit far too narrow and in need of resurfacing). Infrastructure is still primarily shared paths out of the city, but at least on the A563 Soar Valley Way, the path is smooth, wide and well-signed making it easy to use and navigate. The Great Central Way provides a very nice (if straight and long) route from there, right into the city – and that’s where things get a little mixed. 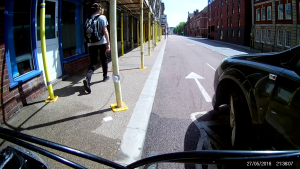 It’s not always clear at times whether cycling is permitted or not (I assume it is, unless I see something obvious saying otherwise), and as is common in Britain, I can’t see signs of a properly connected cycle network. 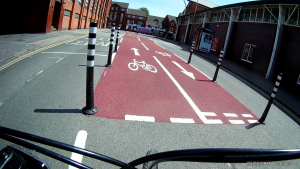 There’s the usual painted lanes in the gutter of some roads, others have nothing – but there are interesting bits where well-defined cycle-only paths do exist. Some are weird, such as the bright red bi-directional route for a hundred metres or so, placed literally in the middle of the road; others were better but with issues, such as a bi-directional cycle path segregated from main traffic and visually separate from the pedestrian footpath – but obstructed with parked vehicles. Then you’ve got some interesting modal filters such as roads signed as ‘no entry except for cycles,’ which is nice to see. 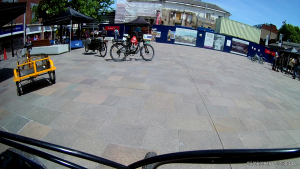 Ultimately, it still needs a lot of work and I found city centre navigation a little confusing – I’d have liked to have seen more signage routing to the National Cycle Network routes including the Great Central Way. 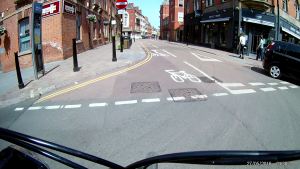 Segregated routes are good but need enforcement to keep vehicles off them, and the need to be part of a connected network. However, what is there (in the city and the wider county) exceeds Coventry and North Warwickshire’s offer by a long margin, in my experience. As I mentioned, I had a reason to visit Leicester besides undergoing my record distance ride. It was to see what was going on as part of the Open Streets event. Unfortunately, I was quite disappointed. The advertising for the event promised “a bike-fix & bike try-out on Market Square and a Cycle Market for Leicester bike shops & projects and interactive entertainment and street-food there is something for everyone.” All I could see was a small selection of different cycles, presumably available to try (not something I wanted to do, so I didn’t enquire) and a seemingly unmanned bike-fix marquee. As far as I could ascertain, there was no interactive entertainment and no street-food. Certainly not something for everyone and it’s probably a good thing i didn’t bring the family. I’m not clear if this is something brand new for Leicester where maybe there are teething issues. This is advertised as a new event and 24 June is listed as the first date, although presumably past dates would be removed so, that’s not conclusive. To that end though, I might try it again in a few months or next year if it continues then, in the hope that it will grow and become something significant. 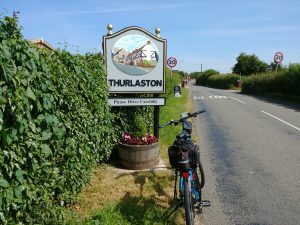 This entry was posted in Blog, Rides and tagged A47, A563, Enderby, Hinckley, Infrastructure, Leicester, NCN6, Open Streets, Soar Valley Way, Thurlaston on 24/06/2018 by Ben.